Today's Prize: Certificate for four guests to enjoy wine tasting and tour at Burgdorf's Winery in Haslett, valued at $100. Certificate will be sent to winner. When you think of Michigan’s wine country, you probably think of the vineyards in places like Traverse City or the Leelanau Peninsula. But while the sandy soil along the lakeshore is where most of the state’s wine grapes are grown, there are plenty of wineries in other parts of the state. Burgdorf’s Winery in Haslett is celebrating its 10th anniversary this year. Happy anniversary to Burgdorf's Winery! YESSSSSS ... it's the return of WIOG! 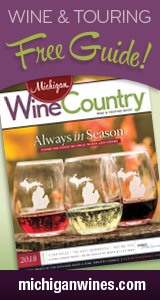 The latest edition includes wines we tasted earlier this spring on wine trail visits and the Michigan Wines Showcase. Since we end up tasting a LOT of Michigan wine (you may have noticed), WIOG is our attempt to give you an idea of some selections that you may be interested in checking out based on what we've been experiencing. Cheers! This giveaway is closed as of 11:59 p.m. April 27. Stay tuned for the next one! Michigan Wine Month is winding down, but there's still time to win in the MBTB SUPER HUGE Michigan Wine Month Giveaway! Today's Prize: Private wine tasting for four guests, which includes a tour of the winery production facility and tasting of several of Burgdorf wines with the owners, Dave and Deborah Burgdorf. Head on over to our Facebook page to enter! The deadline for today’s giveaway is 11:59 p.m. Sunday, April 27.